XenServer is comparable to VMware ESXi hypervisor (for those who know). 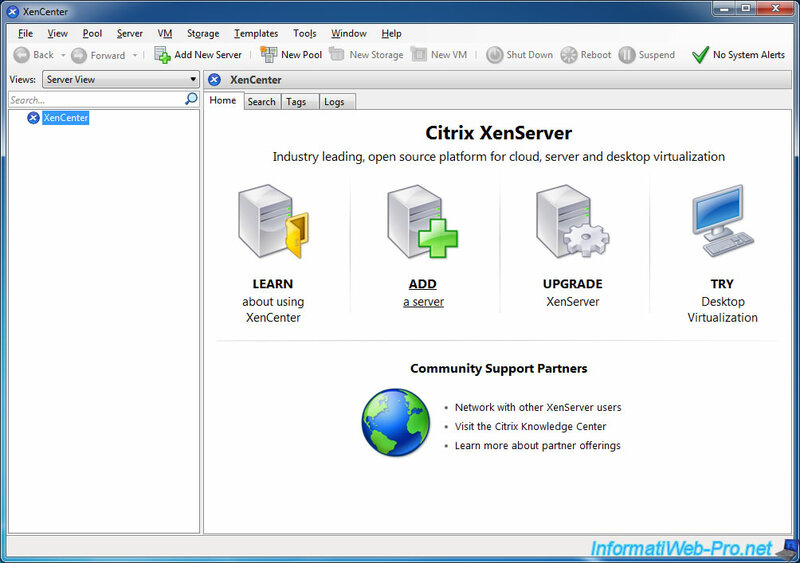 XenServer is based on a Linux OS (specifically : CentOS 64-bit). Like VMware ESXi, it works on a principle "client / server". So you will need 2 computers or 2 virtual machines to install and use XenServer. - XenServer is free, like its counterpart : VMware ESXi. 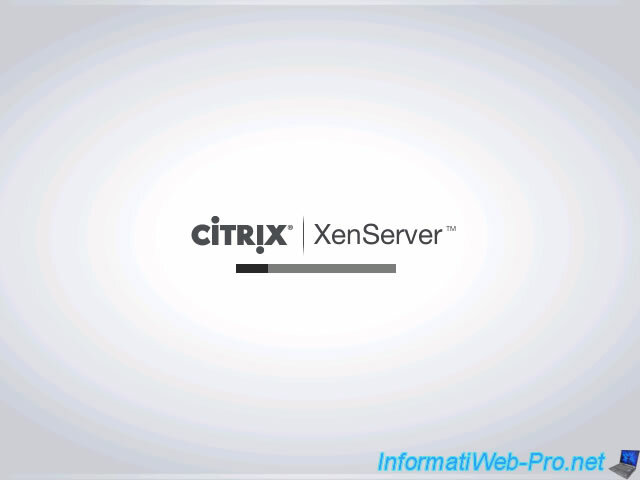 - XenServer uses the "CPU virtualization" and operates in 64 bits. - To enable this feature in the BIOS of your motherboard, read this : Enable virtualization (Intel VT-x / AMD-V). - If you install XenServer in a VMware virtual machine, you need to enable virtualization of Intel VT-x or AMD-V for this virtual machine. For that, go to the settings of the virtual machine -> "Processors" and check the "Virtualize Intel VT-x / EPT or AMD-V / RVI". Note : You must also enable processor virtualization in the BIOS of the physical computer. Tutorial updated on : February 28, 2015. Little difference compared to VMware ESXi, Citrix XenServer doesn't allow you to create a local storage (named Datastore in ESXi) for iso files. 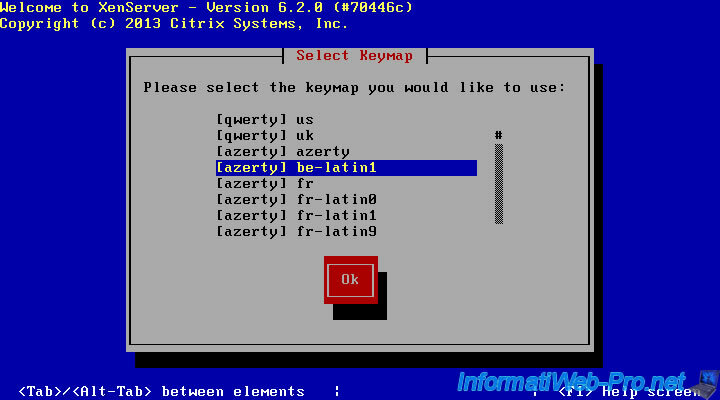 After a long discussion with experts from Citrix, we decided to use a Debian virtual machine that will serve NFS server (solution approved by the employee "James Cannon" Citrix). 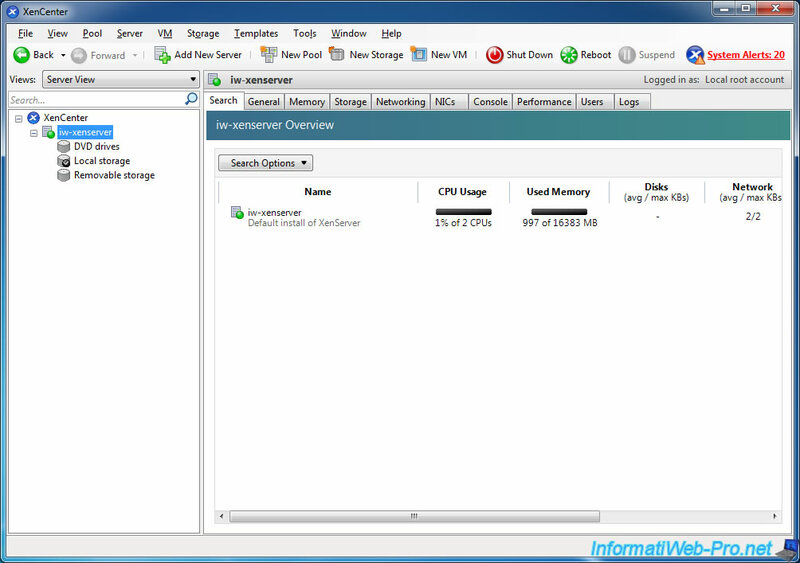 Some sites allow you to create a local storage on a XenServer server using Linux LVM volumes. 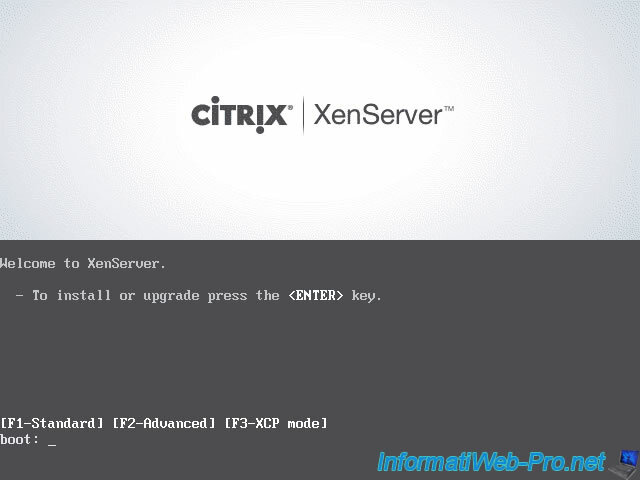 However, it causes problems when the server restarts; it isn't supported by default by Citrix XenServer; and you lose the Citrix support that you got with the paid version of XenServer. 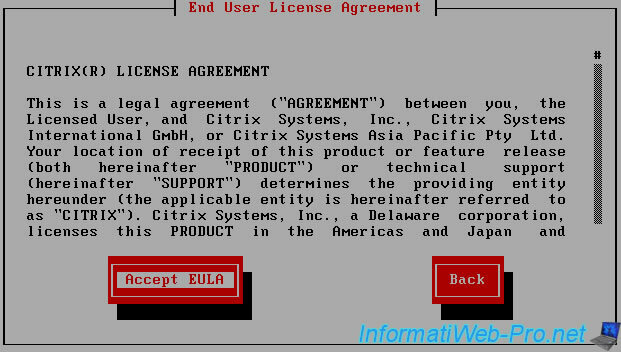 To qualify for the Citrix support, you will need to remove any unsupported configuration (as specified by the employee "James Cannon" from Citrix). To begin, download "XenServer" from the Citrix website and burn the downloaded file on a CD. Once burned, boot the computer on this CD. If all goes well, this screen will appear. Select the layout of your keyboard. In your case : "[qwerty] us". If you need to load a driver, press F9. For example : a SCSI driver. Select the hard drive to use for storing virtual machines. Select "Local media" as the installation source. If you use a physical CD, select "Verify installation source". The installer checks the files (if you have selected this option). 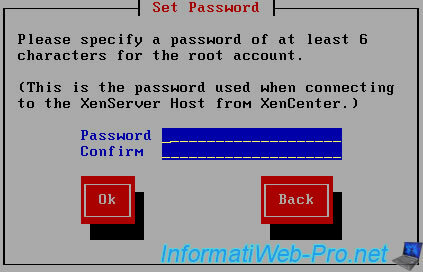 Set a password for the root account on the server. When you install a server, it's strongly recommended to set a static IP address for that server. - Either you set the static IP address on the server. Specify the name of the server and the DNS servers to use. - IP addresses of public DNS servers of Google (8.8.8.8 and 8.8.4.4). Select your continent (to use the correct time zone). And the capital of your country. 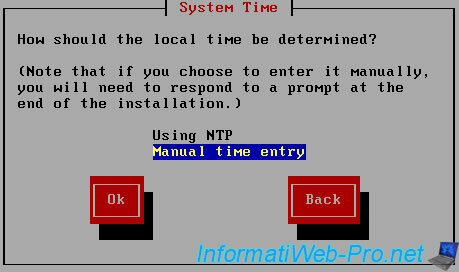 If you have an NTP server (time server) on your network, use it. Otherwise, choose "Manual time entry". Installing XenServer will erase the entire hard drive. 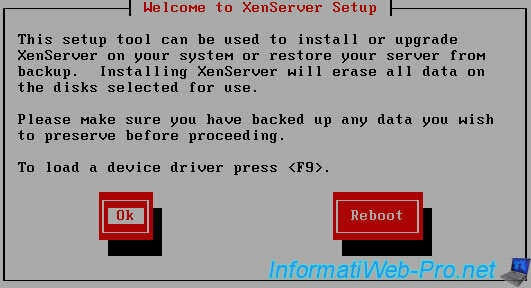 Click "Install XenServer". The installation of XenServer is performed. 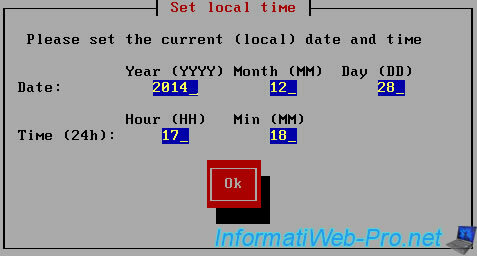 During installation, the installer will ask you for the date and the current time. (This information is retrieved from the BIOS of your computer). At the end of the installation, you must remove the installation CD from the CD / DVD drive. Note : If you install the server in a virtual machine, uncheck the "Connect at power on" case of the virtual CD / DVD drive. And displays the configuration screen. Note : Don't worry, if you want to change a setting, the server will ask for the password of the root account. 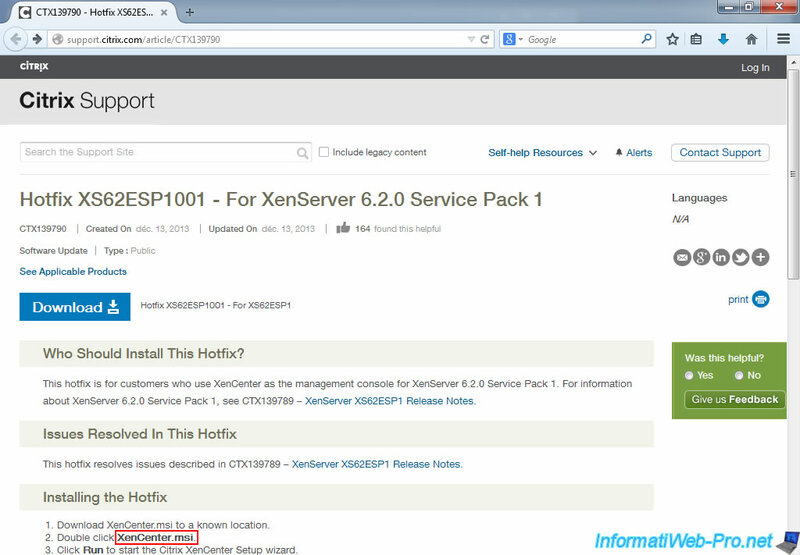 To connect to your XenServer server, you must install the client "XenCenter". 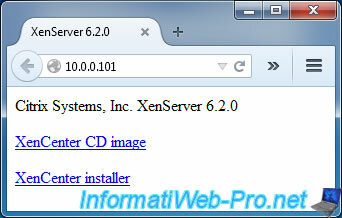 To do this, type the IP address of the server in your browser and click on the "XenCenter installer" link. 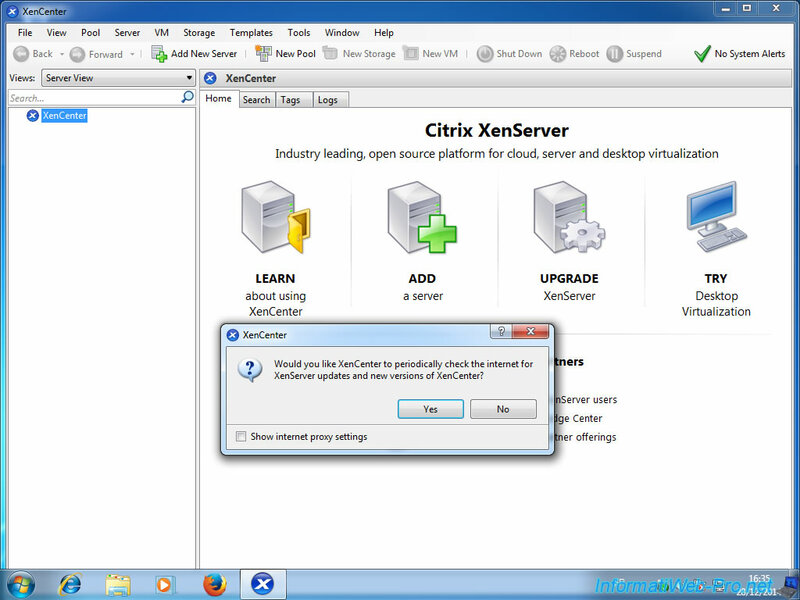 At first startup, XenCenter will offer to automatically check for updates. Click "Yes". 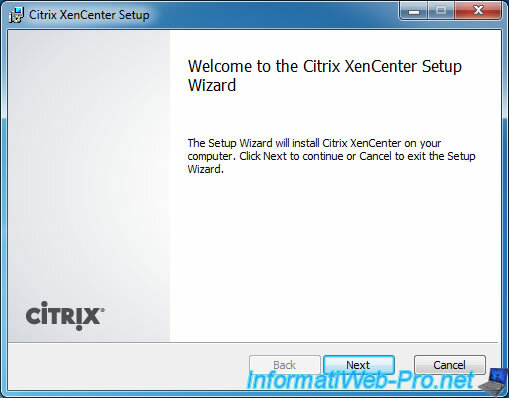 XenCenter find an update for XenCenter. To download this update, right click and click on "Go to Web Page". 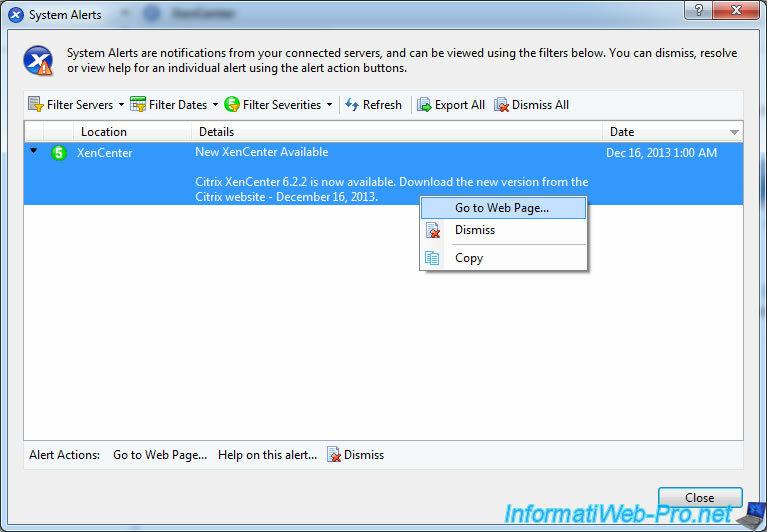 On this page, click the "Download" button to download and install the latest version of XenCenter. Once the new version is installed, click "Add a server". 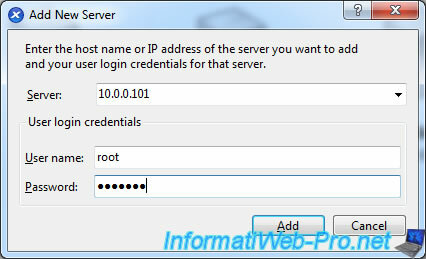 Enter the IP address (or domain name associated to the XenServer server) and the password of the root account. On the main screen you will see the use of resources (by your server and virtual machines that you install later). As you can see, XenCenter has detected 20 problems. In reality, they are updates available (in this case).